Say no to Fantasy Poker Chips! For about the price of a beer in your local pub, now you can see and feel the modern and secure future of poker chips before you buy. These artistically designed chips are made by the exact same manufacturer that makes many of the chips in Vegas today. 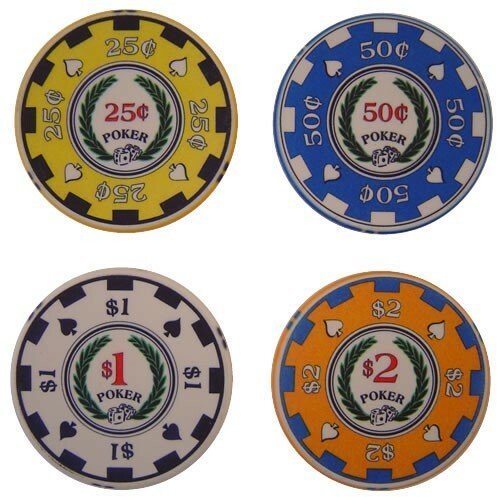 The 2 Archetype Poker Chip Sample is an extremely cost friendly two-pack of these highly touted poker chips sent out via First Class Mail (3-5 business days delivery). Shipping is included in the price! Two chips are just enough to get the feel of how nicely the high-end linen finish chips slide across one another with just the right amount of friction, and how they'll sound when splashing the pot, just like you were in the casino. At this price, there's no excuse not to give them a test drive. 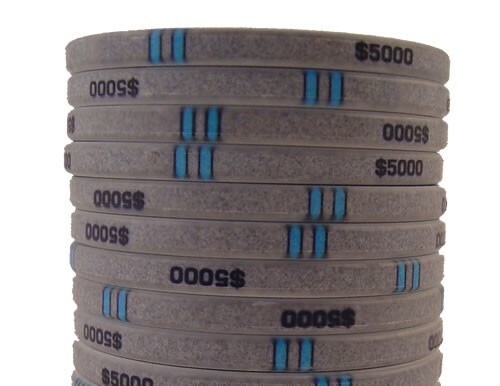 Do yourself a favor and see how nice high-end home poker chips really are before you settle for an inferior set of chips. To allow us to continue offering our samples as these rock bottom prices, the two chip denominations included are determined solely by our inventory levels. Sorry, but no specified denomination requests are accommodated. Our Archetype casino chip line brings the exact same full-color design and single composite material construction chips, that you’ll see in many Vegas casinos today, right into your next home poker game. Casinos that use this chip include landmarks such as the Luxor, the Palms, Bally’s/Paris, the Excalibur, as well as most cruise ship casinos, and many US casinos outside of Vegas and around the world. 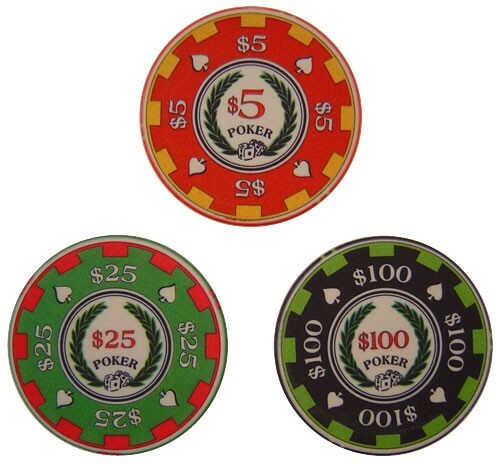 While most Vegas casinos still use a clay chip that is a very close relative of our Modern Clay poker chip line, chips just like our Archetype casino chip line are popping up more and more in Vegas as they allow for much higher resolution graphics and security. 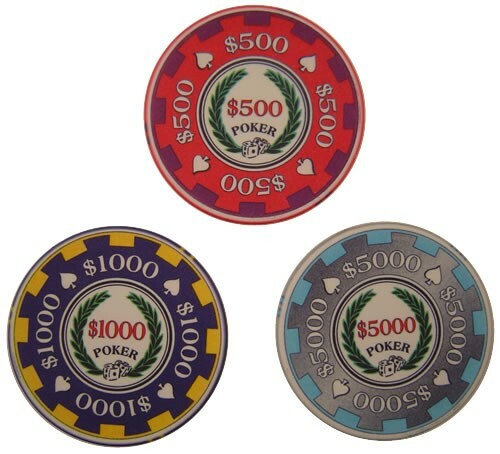 Our professionally designed Archetype casino chip line takes full advantage of the high-resolution graphics and rich color spectrum provided by the unique manufacturing process of these ultra-durable 10-gram chips. The colors and design came out so well on these chips, you may have a hard time taking your eyes off them. Quite simply, they’re stunning. 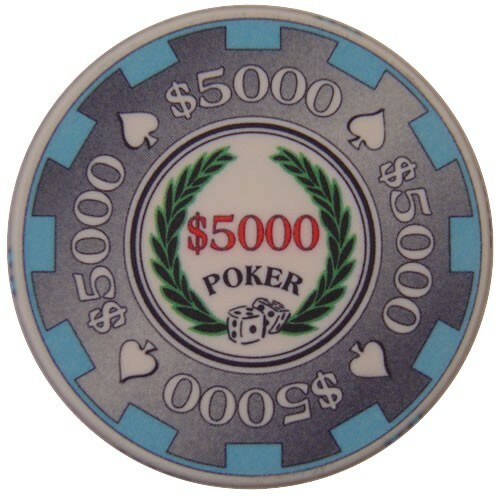 Additionally, and unique to this style chips, the denominations are printed on the rolling edge of each chip in addition to on the face. The touch and feel of our Archetype casino chip line has a distinctive smooth yet textured linen finish. They’re smooth, but not slippery, which is very important. Because they are not clay, the tendency is to assume the touch, feel, and sound of these chips is similar to all other composite-type chips. This couldn’t be farther from the truth as the feel of these chips has been refined over almost two decades. They feel 100 times better than poor imitations, cheap plastic chips, or the so-called “clay” chips that come out of China. Other composites can feel anywhere on the spectrum from sand paper to hard plastic, which is why you won't find any of them in Vegas. Attractive Classical Design - These chips feature some of the best design in the industry. You can see images of our popular Archetype chips featured prominently in Dealmaster 2.0 and on the cover of William Poundstone's latest novel Fortune's Formula. Chips are a bit pricey, but then again, you get what you pay for, and these are very nice chips (archetype). Easy to work with and great to have free shipping, because these chips are not light.